Kim Fundingsland/MDN It is a moment of mixed emotions when the float plane returns to the dock. It is hard to say goodbye to a wonderful, wilderness fishing experience. POINTS NORTH, Saskatchewan — It may not be the end of the world but you can certainly see it from here. Those words may have first been spoken by an early visitor to the lakeshore outpost Points North, with a dirt runway and float planes that wear skis for much of the year. Pilots here fly fishermen and assorted adventurers into the remote and otherwise unreachable wilderness. Some come to make long canoe trips down vast drainages that have seldom been visited other than by the abundant black bears and huge moose. 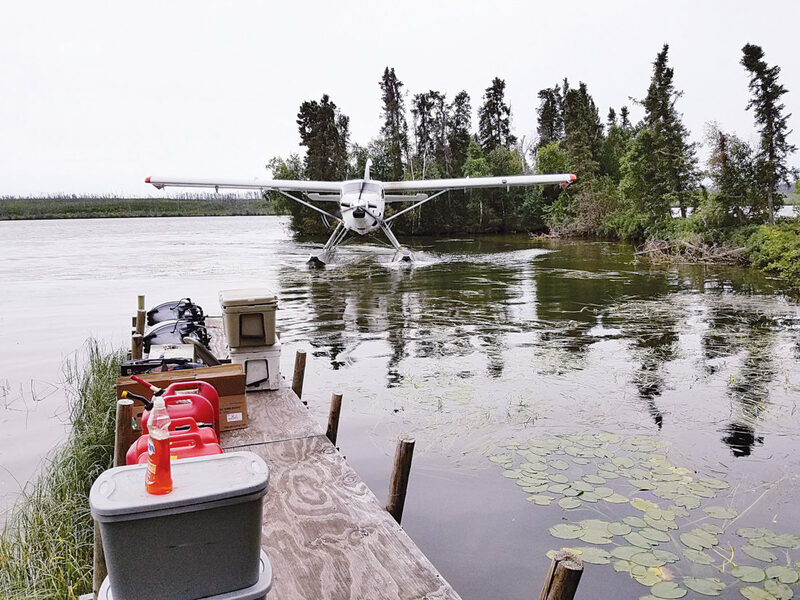 Others land small planes on their choice of thousands of lakes to cast glistening lures to unsuspecting fish – northern pike, walleye and lake trout. Northern Saskatchewan is truly a place where there is no limit to unforgettable memories. It never disappoints. Although this journey was not new to us, we knew at the outset that it would be different. Each Saskatchewan trip is. If there is a way to enjoy traveling over 300 miles on a road that is a combination of gravel, dust, clay and an assortment of vehicle challenging potholes, Saskatchewan has discovered it. Making such a road through thick forest is no easy task. Traveling on it, even with its obvious limitations is, curiously, strangely enjoyable. There are countless roadside lakes and rivers to be crossed along the way. There is the occasional sighting of a meandering black bear and other wildlife common to the region too. Even remote outposts where a traveler can find an aging gasoline pump positioned adjacent to an above ground tank, a reminder of the depth of the winter frost. The stopping points are the wilderness version of an oasis in the desert. Topping off vehicle gasoline tanks, no matter what the gas gauge reads, is sound wisdom in country so remote and unforgiving. From Points North the road actually goes farther north, but it is little more than an unimproved trail through forest and bog. It swallows vehicles or, within a few miles, sidelines them with flat tires, broken suspension or worse. Outside of ice road truckers who brave the road in wintertime, others travel at great risk of becoming stranded in one of the most remote places on the continent. Kim Fundingsland/MDN Big northern pike, like this one caught by Mark Johnson, Bismarck, add to the memories of time spent in the great outdoors. We loaded our Otter float plane with enough provisions for the four of us for four nights on an island and little more. 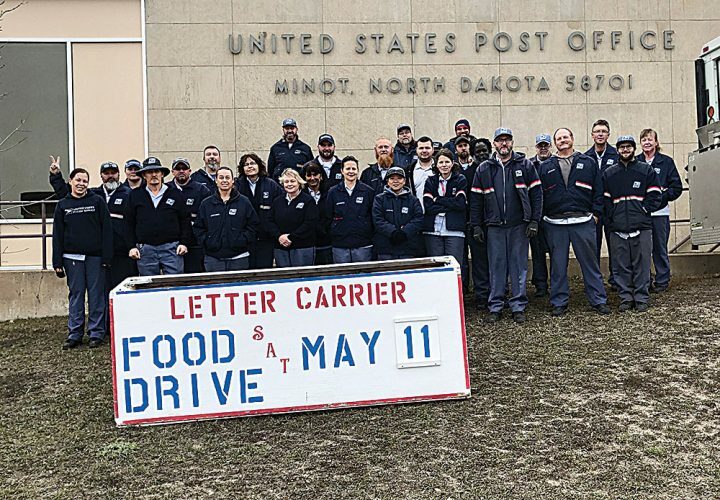 The essentials included food, protective rain gear and, most importantly, fishing rods, reels and tackle. 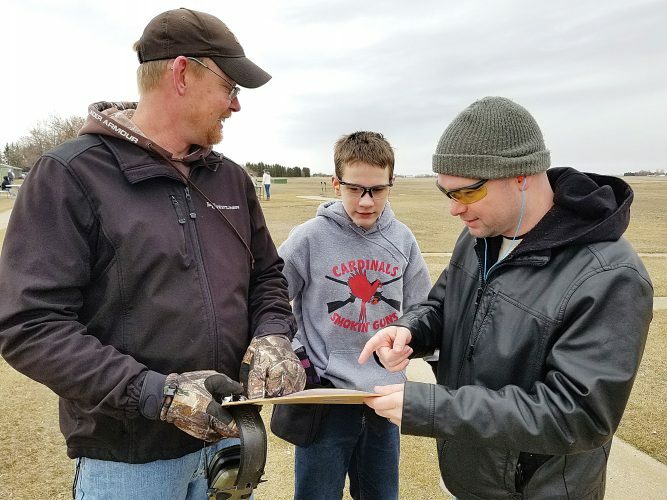 Our pilot, who has flown thousands of times in all types of weather conditions into the wilderness on rescue missions or otherwise, noted we traveled relatively light for such an undertaking. It made us think that perhaps we forgot something essential. Taking off was smooth, at least by float plane standards, and soon the evergreens beneath us grew smaller and smaller. Our flight took us over a mixture of bogs, lakes, rivers and forest, sometimes obscured in the smoke of distant wildfires. However, it wasn’t long before our destination lake came into view and the pilot brought the plane to a gentle landing on the water. As the waves lapped against the floats supporting our aircraft, we taxied across the water to the island that would be our home for the next four nights. Scarcely two hours later, with camp set up, we began preparations for a full afternoon of fishing. It took only a few casts for all of us to get hooked up with scrappy northern pike that were overly eager to greet us. It’s little wonder how the lingering effects of lengthy travel on a questionable road and the hidden anxiousness associated with flight suddenly disappears when the feel of a tugging fish is transported from lure to line to rod to reel to hand. It is what we were all anticipating. How many fish we caught that first afternoon I cannot say precisely but certainly it was in the dozens. All were released. Stories were told during the evening meal. Elsewhere the tales would be kept to yourself lest you be labeled a boastful liar. But in the company of others who had similar experiences in the previous several hours there was no such concern. Fish struck lures pulled through the water, dangling over the side of the boat and attacked surface lures with a vengeance. Some pike even came out of the water to catch lures on their downward arc. 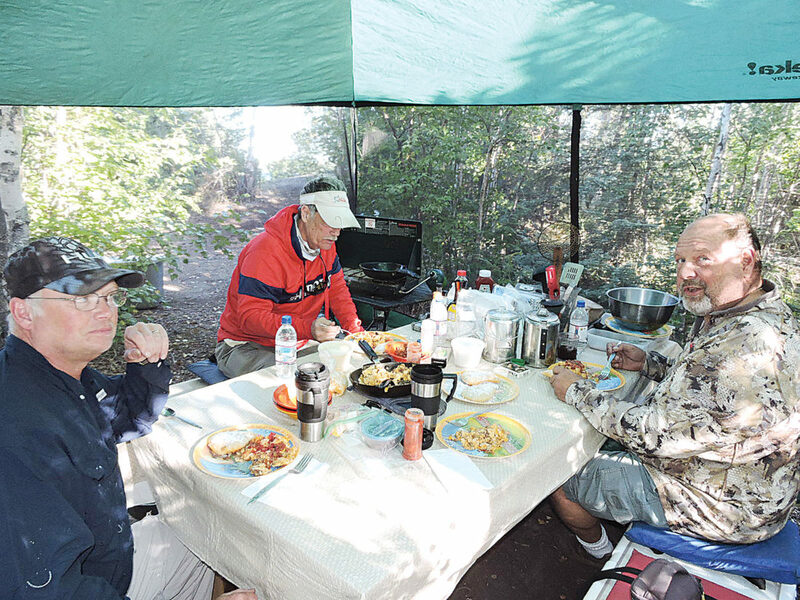 Kim Fundingsland/MDN Mark Johnson, left, Mort Bank, center, both Bismarck, and Hugh Kramber, Eden Prairie, Minn., enjoy a good breakfast before a day of fishing in northern Saskatchewan. Fishing? Yes. But catching is a more appropriate description. As the sound of the last shuffle of cards faded away in favor of the sounds of fish jumping on a warm and still night, zipping up the sleeping bag was frivolous. The unmistakable calls of the loon echoed over the water and across our island home as we succumbed to sleep in the fresh air of the Canadian north. Cots never felt so comfortable. As I stepped out of the tent the next morning I could hear the sound of the wings of flying loons before a pair of those graceful birds came directly overhead almost close enough to touch. A flock of Canada geese vocally announced their presence too. From the cook tent a few yards away came the wonderful aroma of fresh brewed coffee. Day two had begun. For breakfast we had marvelous omelets and “alien ears,” a special treat courtesy of our experienced cook and gracious host, Mort Bank of Bismarck. Dishes were quickly washed and boats loaded for a day of fishing. Off we went, two boats in separate directions. Bank caught the biggest fish of the day, a 27-pounder that put up an excellent fight. The photograph of the big fish was shared at camp. No official count was made of fish caught by the four of us that first full day other than to say too many to count, pike and walleye. Kim Fundingsland/MDN Really? Mort Bank, Bismarck, caught a Saskatchewan northern pike with a tail sticking out of its mouth. 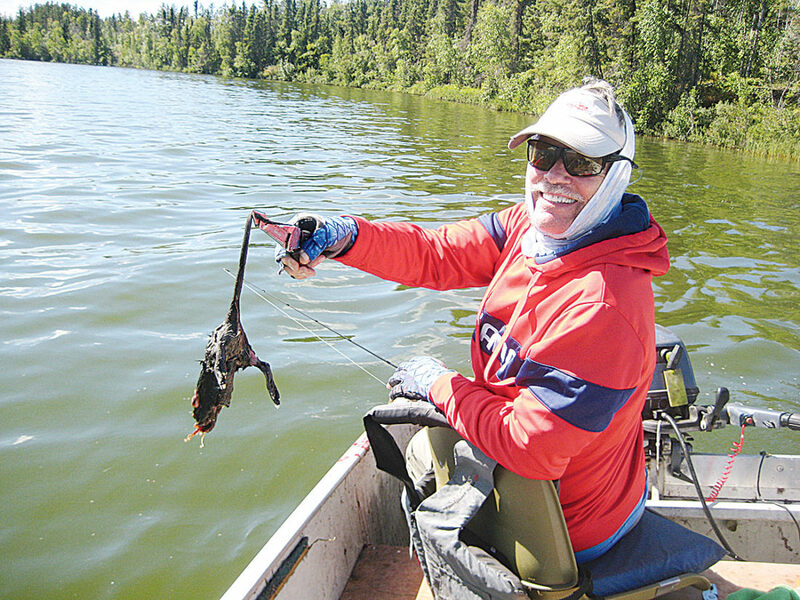 He pulled this muskrat out of the pike, making it one of the oddest catches he has experienced in a lifetime of fishing. That evening the hot coals of a previously crackling fire provided perfect heat for a generous rack of ribs, cooked to perfection by Bank. Combined with a Caesar salad it was a startling contrast from the freeze-dried pouch meals more common to such adventures. During the night the wind came up. By morning though, it had died down to the point where the waves were easily manageable for our 16-foot boats. My day was marked by two moments more memorable than a hundred others. First was a black bear that was swimming within yards of our boat. Due to the glistening rays of sun on the water I had initially mistaken it for a young moose. Thankfully, the bear was more interested in a nearby shoreline than climbing into our small craft. Second was a pike, a good one, that I had enticed with a bubble-gum paddletail. At boatside the pike threw the lure and it came high out of the water. After retrieving the lure I looked down and the pike was lying next to the boat. I dropped the lure back into the water, the pike made a quick spin and inhaled it. Terrific stuff! We estimated the fish’s weight at 17-18 pounds. Bank provided what turned out to easily be the most unusual catch of the trip, or any fishing trip for that matter. A pike he caught had a long tail protruding from its mouth. Using a pliers for grip, Bank extracted what appeared to be a muskrat from inside the pike! Classic moment indeed! Supper was monumental – a seafood boil complete with seasoned butter warmed over candles. As darkness made its inevitable arrival so too did increased wind which we interpreted to be the onset of a cold front. On this night it was sound wisdom to zip the sleeping bag. Sleep arrived quickly. Morning proved to be a bit cool with a temperature in the mid to upper 40’s. However, it quickly warmed and we were on the water once again. Notable was a pair of pike caught by myself and my boatmate, Mark Johnson of Bismarck. I caught a 23-pound pike that caused a certain amount of welcome havoc in the boat. Moments later Johnson topped that with a 26-pounder. Thank you Saskatchewan! For two days I used a clicker to get an actual count of fish caught. The first day it read 84 and on the second day 90. So many fish can take a toll on equipment, but we had been through it before and were better prepared for the test than in previous years. Our final night on the island was marked by a distinct increase in wind, so much so that the snapping of walls of the tent continued throughout the night. We could hear what we thought was thunder, even a few sprinkles of rain, but we awoke to a reasonably pleasant morning with the exception of the wind. No complaints though. How silly. We had breakfast and hastily broke camp in preparation for the arrival of our float plane which proved to be on schedule. The four of us watched with mixed feelings as the pilot maneuvered the plane so that we could load our gear onto it. It’s always nice to go home but it was also difficult to leave. Exhausted, in a good way, we buckled into our seats on the float plane and, sadly, left our lake and treasured island behind. Submitted Photo Fargo’s annual Kidney Walk has been hosted for around 10 years, giving those in the community or those visiting, a chance to participate in a free event to raise money for the National Kidney Foundation. 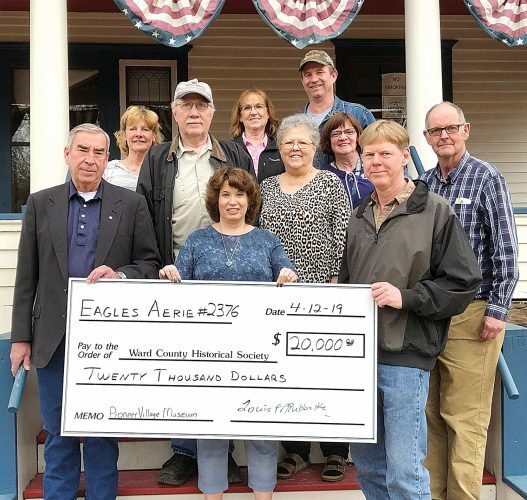 Submitted Photo From the left, Minot Mayor Shaun Sipma, City Manager Tom Barry and Tioga Economic Development Director Dennis Lindahl were among leaders from the Dakotas and Wyoming attending a White House event this past week. Submitted Photo An airman pets Boeffie, 5th Security Forces Squadron military working dog, before a familiarization training flight at Minot Air Force Base, Aug. 23, shown in this photo by Senior Airman Jonathan McElderry. Submitted Photo Staff Sgt. Timothy Driver, 5th Security Forces Squadron military working dog handler, adjusts safety equipment for Deny, a military working dog, during flight familiarization training at Minot Air Force Base, Aug. 23, shown in this photo by Senior Airman Jonathan McElderry. This was the first time the K-9 unit has flown with the 54th Helicopter Squadron. Submitted Photo Lindley Creek is made up of Jase, Katie, John and Kathy Greer. All perform a different role in the music to produce an up-beat, family-friendly acoustic sound.